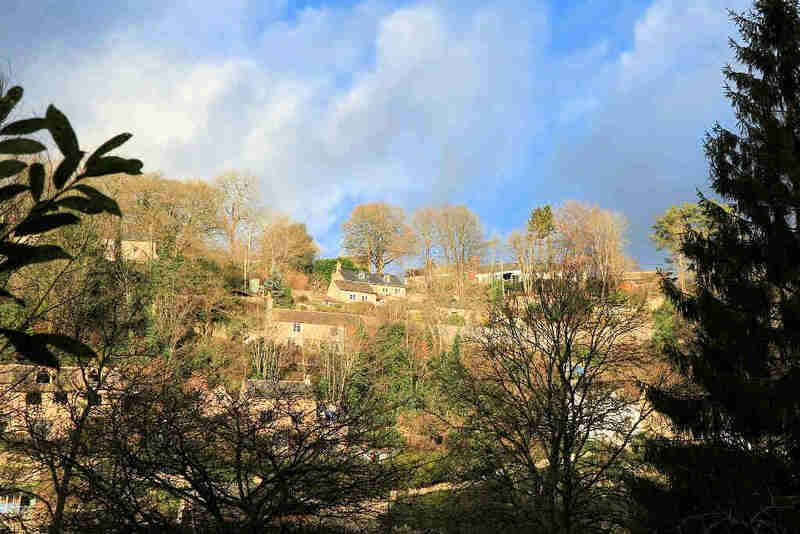 This walk starts at Chalford and takes you to the lake at Bakers Mill, and then back along a quiet single track road that takes you through an area known as Ashmeads. The round trip is a little over three miles plus you can stop off at either the red Lion pub along the Chalford high street or The Lavender Bakehouse cafe for tea and cake on the A419 on your way back should you need refreshment. There are also a few options for exploring the fantastic views of the Chalford valley from various high edge valley paths. I grew up in this valley so I have put in a couple of childhood memories. Parking at Chalford is problematic at the best of times and the best option is to use a very long layby on the A419 just before the turning to the high street or on the verge at the other side of the road. Don’t bother trying to drive up the high street, there isn’t any parking and nowhere to turn around! You can do this walk either way around, but I will describe the canal path first option. The canal path starts just as the A419 starts to go up the hill. 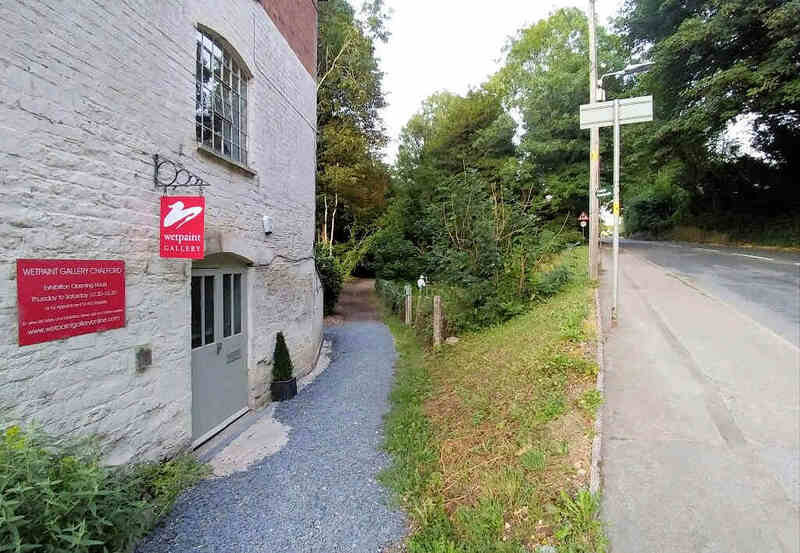 The Lavender Bakehouse cafe is more or less opposite the start of the path. If you get to the railway bridge you’ve gone too far! If you see the sign below, you’re on the right path. The first section of the path takes you past the Red lion pub and on towards the playing fields. At the start of the walk to your right you will see a substantial stone wall. This supported the old GWR railway goods yard that’s since been converted into a small housing estate. 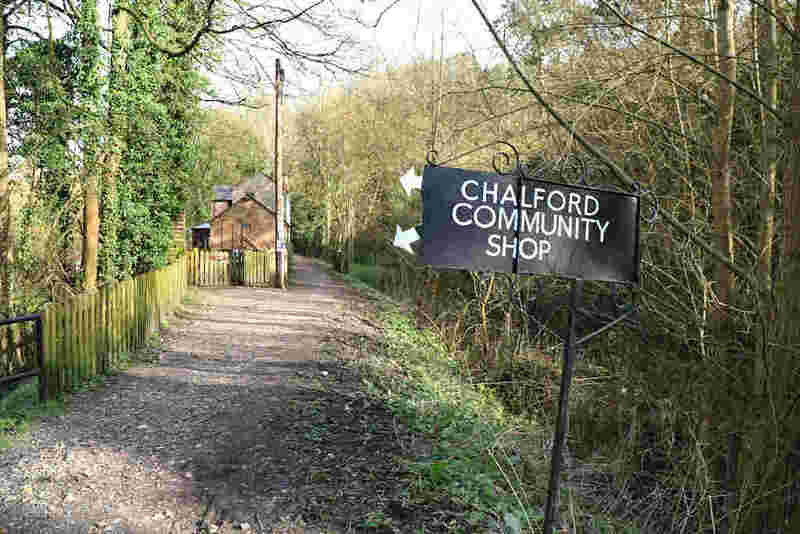 There was also a small railway station here known as the Chalford Halt that was serviced by a railcar, a small steam engine and a single carriage. Where the canal goes under the main A419 there was once a lock called Bell Lock thats been infilled. Don’t expect to see much water in the canal anywhere along this stretch in the summer as it was notorious for leaking, plus none of the locks in this section have any lock gates on them to hold what trickle of water there is back. The first intact lock you will see is Clowes Lock and is somewhat overgrown. 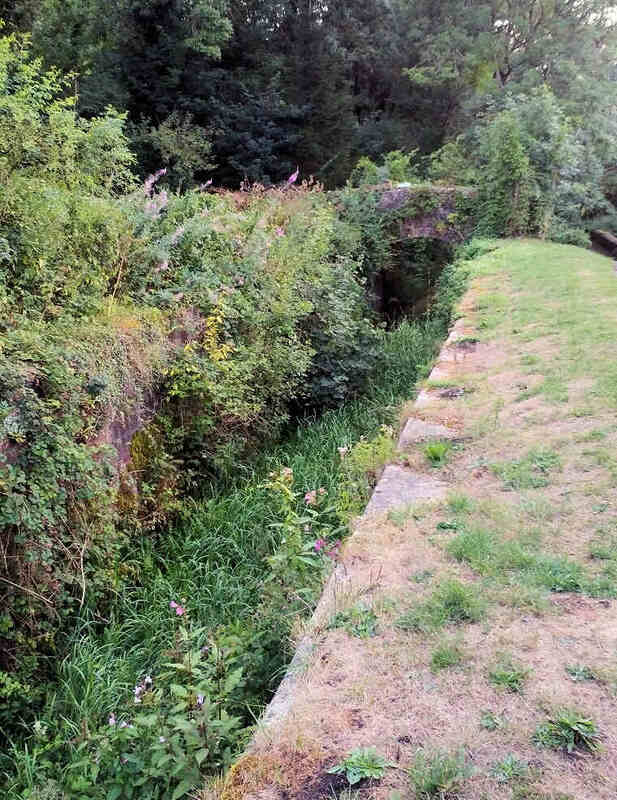 Clowes Lock, looking somewhat overgrown! 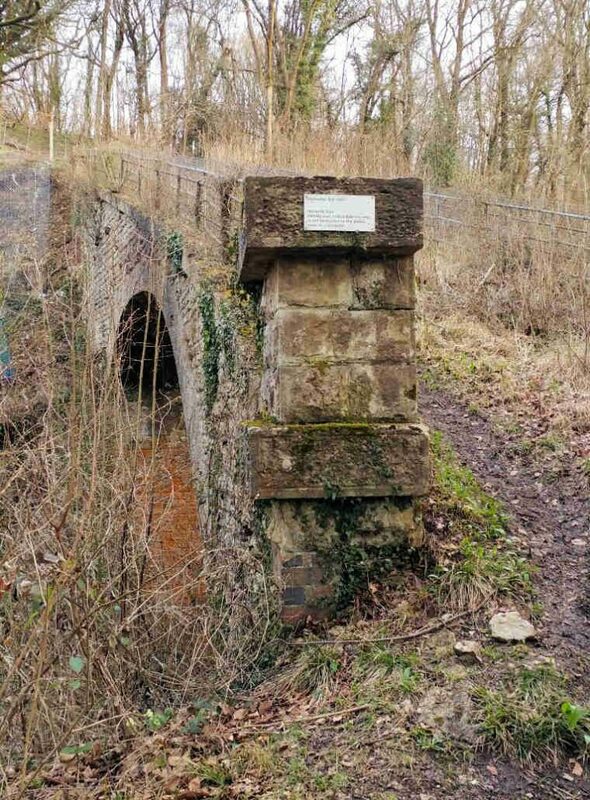 The small bridge over it connected an old pack horse trail between Minchinhampton and Bisley. After this the canal narrows a little as it winds to the right to go past the long gone Seville’s Mill pond. In the past there was only room for single narrow boats in this section. The start of the railway viaduct appears shortly afterwards. The viaduct gives the railway a platform along the very (very) steep bank that we somehow used to scramble up and down as kids back in the early 70s. Up on the bank just before the viaduct you might see a danger keep away sign if its not too overgrown. There is a rather deep well up there that we discovered by accident. It was incredibly dangerous, suddenly we were confronted by a huge hole in the ground with quite deep looking water that probably drops down to canal level. Nobody seemed to know what it was for but there used to be a railway engine shed above it for the steam banking engine to help haul trains up the steep incline. I suspect it was a water supply for the steam engines. As kids though it was perfect for chucking huge rocks down! 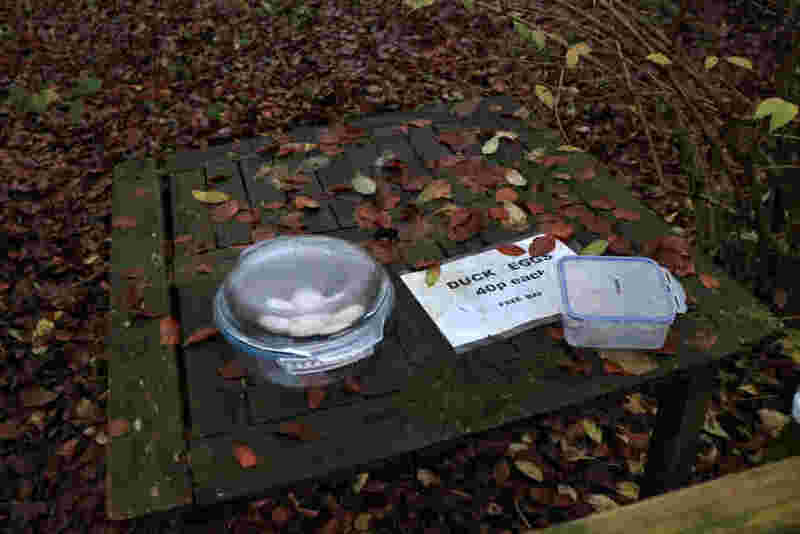 Back to the path, and you will next see duck eggs for sale on some ground that’s home to ducks and geese. 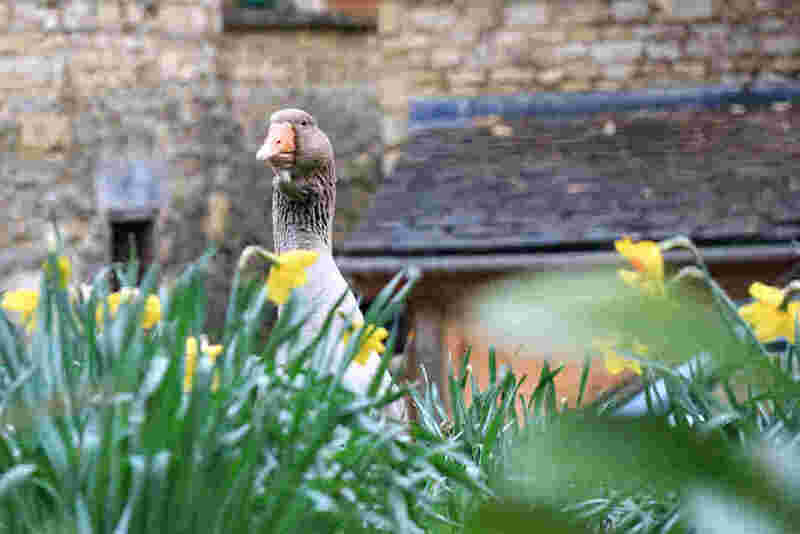 There are all sorts of ducks and geese at home here, the one in the photo was in among the daffs. Just before the duck pen there is a path that takes you through to the Chalford high street. This area has changed a lot over the years. In the days of dark satanic mills there was once a dark satanic mill here called seville’s mill, and like many along the valley it was powered by water. That was later demolished and a more modern factory was built there that used to make gaskets for the motor industry and cardboard boxes. I had a Saturday job there when I was at school putting sheets of cardboard into a machine that cut slots into it ready for the next process. That job was boring as hell! That factory has now also been demolished and housing built in its place. The next section has the river Frome on your left and the canal on your right. The large building to the right is the old Valley Inn public house, now a residential property. This was once called the Clothier’s Arms and was the home to a mill owner, as were many of the larger houses. Moving on you need to cross the small road by the playing fields. There was once a mill called Tyler’s Mill at the entrance to the park that was demolished in 1933. I think part of its water workings can be seen by the playing field entrance as the river feeds off through a narrow channel of stonework. The playing field used to house what must have been the worlds highest slide. I was never good with heights and compared to the standard low things with a big wooden box at the top to stop you falling out this was a true sky scraper and not for the feint of heart! If you took a candle to the slide section it became incredibly slippery and fast! I think it’s been the victim of the health and safety man as it was taken down a long time ago. Back to the canal path to continue the walk you will see a large red brick building on the other side of the canal with a big iron pressure vessel beside it. 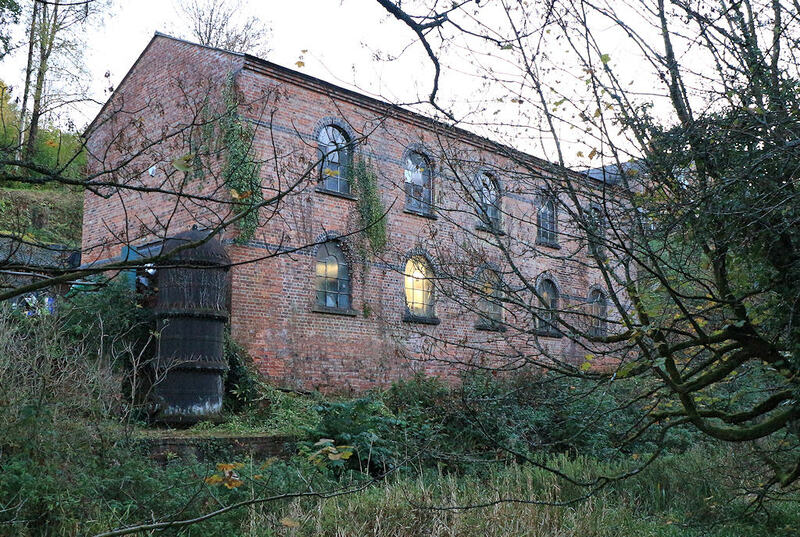 I think this is an old water works pumping station. Higher up on the bank (top right) was a then waterboard owned house that had four huge reservoirs in front of it. Either this building pumped water up to fill them or they fed this building. Or both depending upon water levels. When I was a youngster I had a friend that lived there and the reservoirs were no longer in use. We knew them as ‘the pits’ and were great play areas once you’d got the nerve to walk along the very narrow wall between them to get to the ladders down into them. These have since been filled in. The rest of the walk towards Bakers Mill is out in the countryside with the tow path running between the canal and the river frome. This section of canal in the winter may have a reasonable amount of water in as there’s a dam by the playing fields. There was once a large punt in this section that somebody had built to transport logs down the canal. One stormy winters night the punt managed to get washed all the way to the dam by the playing fields, go over it and into the lock beyond it, then on down the canal to get wedged between some trees in the narrows before Clowes lock. That formed our best toy for a few years until we decided to make it into two boats by sawing it in half. Lesson learned, don’t saw a perfectly good boat in half, we wrecked it and never got two boats out of it! Just before you reach Bakers Mill lock there’s another dam just after what was known as Boultings Lock. 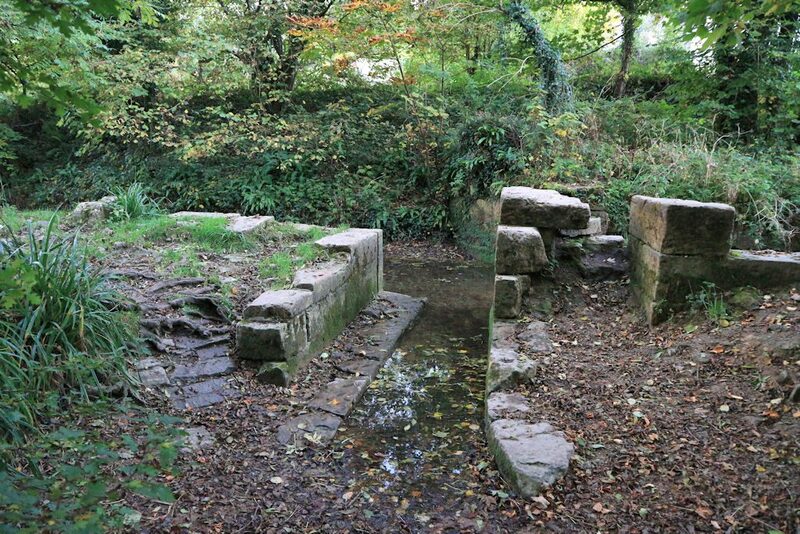 The pond between them was always leaking and in about 1817 the canal bed and sides were concreted over to stop the leaks. That pond then became known as ‘The Conk’. In the early 70s it was a good clear stretch of deep water but now it’s all overgrown, especially in the summer. The ducks seem to like it though. Quack quack! Beyond this the path goes under a bridge and up the side of Bakers Mill lock. If you follow the path a little longer you will see the lake that was built to keep the canal topped up. Getting back to the walk, cross the small wooden footbridge before you get to the lake to get to the road and turn right. The road (single lane) takes you over the canal and at the junction turn left to take you back to the main road where you left your car. If you feel like a diversion you can take a track literally on the bend before the road bridge that takes you up through the wood to an interesting old bridge called Jackdoor Bridge. 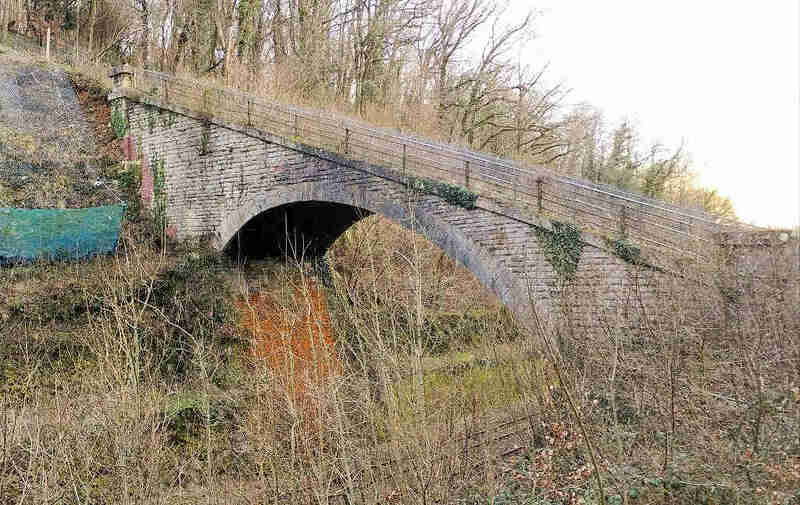 This crosses the railway and is notable for its strange shape and incredible steep path across it. The walk back along the road takes you past water meadows to the left and woods to the right. 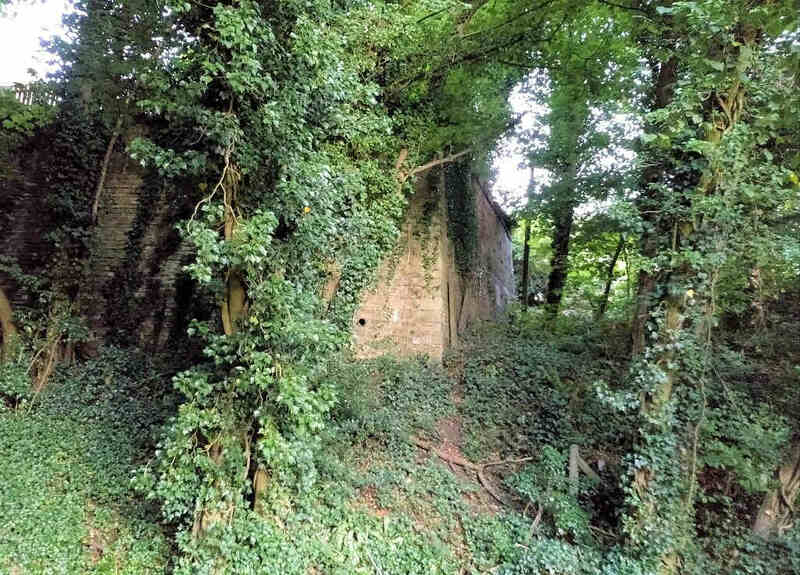 The woods were once used as a source of pit props that were carried down the canal. 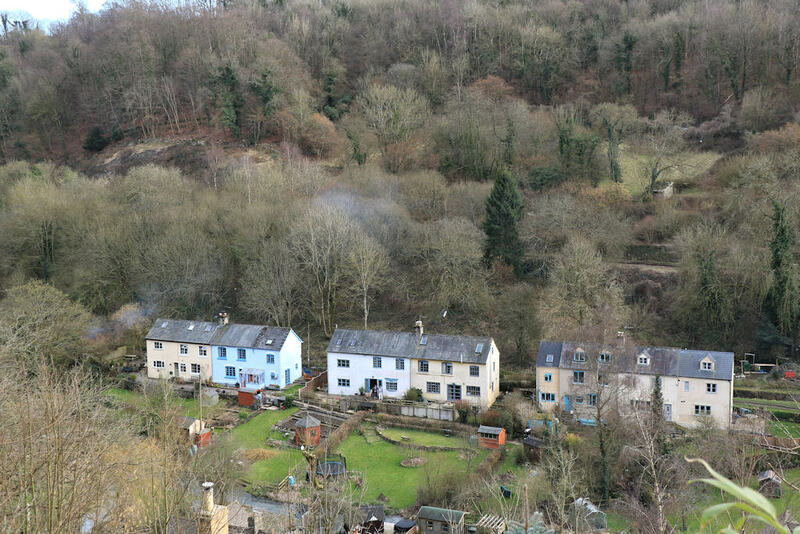 As you get to the playing fields you can get back onto the canal path or carry on along the road that takes you through the small village of Chalford that’s full of houses perched on the steep valley sides, many of which were once weavers cottages that home workers used. There are a number of steep paths that take you to up the valley sides and a nice walk is what I know as ‘The top Path’ that skirts along the side of the valley and offers fantastic views down into Chalford. Looking into the Chalford Valley from a hill side path. The canel is the other side of the houses and the old Great Western Railway is just up the bank. Chalford station would have been to the right of the houses. A donkey was used in the past to ferry peoples shopping up to the houses, known oddly enough as The Chalford Donkey. The Donkey was recently reintroduced but I’m not sure if it’s still being used.